When I want to learn how to do something, the first place I go is YouTube. There is an abundance of information on there. You can learn almost anything on YouTube. 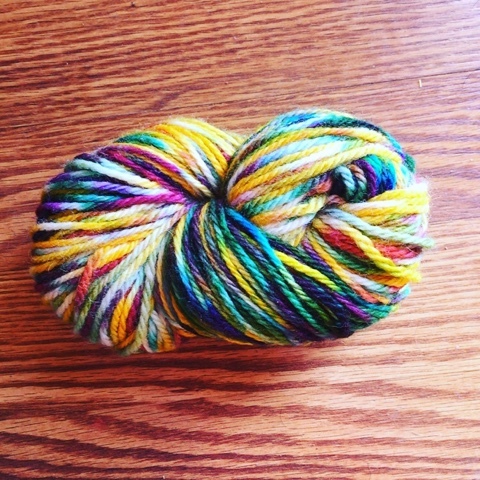 I must have watched about a hundred videos on how to dye yarn. They all seemed to have the same steps. 1) Start with any animal fiber yarn. Acrylic yarn will not work! I chose Patons natural wool. 2) Pre soak the yarn. This helps the dye to penetrate. At this point you can choose to work over the stove or on the counter top, but the last two steps involve the dye, vinegar, and heat. If you choose the use the counter top, you can lay out your yarn on some plastic wrap. Mixing dye with water and vinager (some people used citric acid) and then using a spoon or syringe place the dye over the yarn where you want. Then wrap in plastic wrap and place in microwave for about 15 minutes. I chose to dye mine on the stove. I filled a pot with water and a few tablespoons of vinager. Let the water come to a very slow boil or simmer. Then I placed my yarn inside the pot. I had mine rolled in a cake. But most people had theirs in a hank. Then I used my syringe to place the color where I wanted. Placed the lid on it and let it simmer ( never a full boil) for a while. You are suppose to let it simmer until the water around the yarn is clear. I was way to impatient for that and also was not liking the way the colors where getting all muddy together. So I pulled mine out after 20 minutes. In both techniques, you let the yarn cool and then rinse the yarn until the water runs clear. Fill the sink or a bowl with some soap and water and the. Let the yarn sit for a few minutes and rinse again. Please keep in mind that aggressive handling of the yarn will felt it because it is a natural fiber. BE GENTLE!!!! After the water is clear once again then let dry and enjoy. DYE: Dye was really the only different factor in the dying process. There are a few different kinds of dye that people used. From powders to liquid to koolaid. I liked the idea of using a food safe dye since I would be using a pot I cook in. I chose the Wilton brand food dye. I use it to dye frosting for my cakes, so I had a lot laying around. I picked three colors. Orange, black and violet. Knowing that the violet and black tend to break, I was excited to see the colors that I would get. Breaking is where the color breaks down into all the other colors used to make that color. The yarn did not turn out how I wanted at all, but I am still in love with it. I can not wait to experiment again.